Coordinates: 25°24′N 94°05′E﻿ / ﻿25.4, 94.08 Nagaland (Hindi: नागालैंड) is a state of India located in the far north-eastern part of the country. 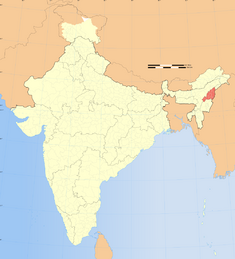 It borders the states of Assam to the west, Arunachal Pradesh to the north, and Manipur to the south. It also contains India's border with Myanmar to the east. The state capital of Nagaland is Kohima, while the largest city is Dimapur. The state has a population of nearly two million people, and a total land area of 16,579 km, making it one of the smallest states in India. Nagaland, along with the other states in India's northeast, has a culture that is quite distinct from the rest of mainland India, leading all of the northeast's states to have the nickname, "The Seven Sister States" due to their cultural separation from the rest of India. Nagaland has played a crucial role in the development of the Republic of India. A mountain tribal people with a history of fierce independence and love of freedom, the Naga tribes embraced the teaching of British Baptist missionaries. As has happened elsewhere, in China and Africa, the loose organizational structure led to a rapid growth of the Baptist community in Nagaland. Traditionally animist, and within the sphere of Tibetan Buddhism's historical influence, 90 percent of the Naga tribes of Nagaland accepted Christianity, most of those Baptists. The Baptist love of freedom and independence fit well with the two million people of Nagaland's love of freedom and independence. The Baptist faith has transformed Nagaland's culture in a unique way compared to other states in India, where Hinduism, Islam, or Buddhism has been the main cultural shaping force. The earliest references to Nagaland can be found in the Indian epic Mahābhārata. Several characters from the region, such as Princess Ulupi and Prince Iravan, are referred to as members of the Naga people in the epic. The derivation of the name "Naga" has been long disputed. Some suggest it is from Noga – meaning hill people in the plains of Assam; others have suggested it derives from Nāga, a race of large serpentine creatures found in the mythologies of Hinduism and Buddhism; still others suggested that it derives from Nanga meaning "naked." In any case, the name was given them by outsiders; the Naga people themselves belong to no less than sixteen tribes with distinct names. Before the arrival of the British Raj, Nagaland was administered as part of Manipur under the Thibomei and Thimbong districts. With the permission of a Manipuri king, the East India Company explored deep inside the naga hills in search of trade routes and other physical resources. In the process, the British brought many Assamese and Bengali traders into the region, from whom the Naga eventually adopted their dialect called Nagamese, which is a mixture of both the Assamese and Bengali dialects. The early history of Nagaland consists of the customs and economic activities of the various Naga tribes that lived in the region. These Naga tribes had socio-economic and political links with tribes in Assam and Myanmar, and even today a large population of Naga people inhabits Assam. Following an invasion in 1816, the area along with Assam came under the direct rule of Myanmar. This period was noted for its oppressive rule and the turmoil it created, both in Assam and Nagaland. When the British East India Company took control of Assam in 1826, they steadily expanded their domain over modern Nagaland as well. By 1892, all of modern Nagaland except the Tuensang area in the northeast was governed by the British. It was politically assimilated into Assam, which was considered as part of the province of Bengal for a long period of time. The British Christian missionaries that spent time in Nagaland played an important part in transforming the culture of the region. As a result of their missionary work, many Naga tribes embraced Christianity, and especially the Baptist faith, making Nagaland into the largest Baptist state in the world as of today. Tanks rolling in to fight off the Japanese near Kohima in World War II. Nagaland played a central role in one of the many battles of World War II, as its capital city of Kohima served as one of the final points where the British and Indian forces were able to turn back the Japanese movement into South Asia. After the independence of India in 1947, the area remained a part of the province of Assam. 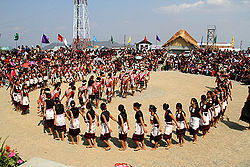 Nationalist activities arose amongst Naga tribes during this period, as they began to demand a political union of their ancestral and native groups. They focused their efforts on damaging government and civil infrastructure as well as attacking government officials and Indians from other states. The Union government sent the Indian Army into the area in 1955, to attempt and restore order. In 1957, the Government began diplomatic talks with representatives of Naga tribes, and the Naga Hills district of Assam and the Tuensang frontier were united into a single political entity that became a Union territory directly administered by the Central government with a large degree of autonomy. This was not satisfactory to the tribes, however, and soon agitation and violence increased across the state, including attacks on Army and government institutions, as well as civil disobedience and the refusal to pay taxes. Nagaland is a largely mountainous state. The Naga Hills rise up from the Brahmaputra Valley in Assam and extend about 2,000 feet, while rising further to the southeast to points as high as 6,000 feet. Mount Saramati at an elevation of 12,552 above sea-level is the state's highest peak, and serves as the point where the Naga Hills merge with the Patkai Range in Myanmar. Rivers such as the Doyang and Dhiku flow to the north, while the Barak River flows in the southwest and the Chindwin River in Myanmar extends in the southeast, dissecting the entire state. Nagaland is extremely rich in flora and fauna. About one-sixth of the state is under the cover of tropical and sub-tropical evergreen forests, including palms, bamboo and rattan as well as timber and mahogany forests. While some forest areas have been cleared for jhumcultivation, many pangolins, porcupines, elephants, leopards, bears, monkeys, sambar, deers, oxen and buffaloes continue to thrive in the state's remaining forests. Included in this collection of wildlife is the Great Indian Hornbill, is one of the most famous birds found in the state and in all of India. Nagaland has a largely monsoon climate with high humidity levels. Annual rainfall averages around 70-100 inches, concentrated in the months between May and September. Temperatures range from 70 degrees to 104 degrees Fahrenheit. In winter, temperatures do not generally drop below 39 degrees Fahrenheit, but frost is often common at the state's higher elevations. The Governor of Nagaland is the constitutional head of state, a position which is similar to the President of India in the national government, because both positions possess largely ceremonial responsibilities. A 60-member Vidhan Sabha includes the state ministers, led by a Chief minister, all of whom are elected members of legislature. This body forms the government's executive branch. Unlike most Indian states, Nagaland has been granted a great degree of state autonomy from the national government, as well as special powers and autonomy for Naga tribes to conduct their own affairs. Under this system, each tribe has a hierarchy of councils, located at the village, range and tribal levels dealing with a variety of local disputes. There is also a special regional council for the Tuensang district, which is elected by the local tribes of the area. Agriculture is the most important part of the state economy in Nagaland, with more than 90 percent of the population employed in growing crops, including: rice, corn, millet, pulses, tobacco, oilseeds, sugarcane, potatoes and fibers. Even with this agricultural growth however, Nagaland still depends heavily on the import of food supplies from other states. The widespread practice of jhum, or clearing for cultivation, has led to soil erosion and loss of fertility, particularly in the eastern districts. Only the Angami and Chakesang tribes in the Kohima and Phek districts use terracing techniques to improve their crop output. Most of the Aos, Lothas and Zeliangs in Mokokchung, Wokha and Peren districts respectively cultivate crops in the many valleys of their respective districts. In addition to agriculture, forestry is also an important source of income, as well as cottage industries such as weaving, woodwork and pottery. The tourism industry in the state has also developed into an important sector of the economy, however much of the tourist activity has been limited due to the dangers of the insurgency that has existed over the last five decades. The railway network in the state is minimal. The length of broad gauge lines is 7.63 km, while that of the meter gauge lines is only 5.22 km. The length of National Highway roads is 365.38 km and state roads is 1094 km. There is one airport in dimapur and another is being planned for Kohima, the state capital. There are a number of different tribes living in Nagaland, including the Lothas, Angami, Ao, Chakhesang , Chang, Kalya, Khiamniungan, Konyak, Phom, Pochury, Rengma, Sema, Sumi, Sangtam, Yimchungru, and Zeliang. Of this large group, the Angamis, Aos, Lothas, and Sumis have the highest populations. As would be expected with so many different groups, tribal and clan traditions and loyalties play an important part in the life of the Naga people. Weaving is a traditional art handed down through generations in Nagaland, and each of the major tribes has its own unique designs and colors, producing shawls, shoulder bags, decorative spears, table mats, wood carvings, and bamboo works. Tribal dances of the Nagas give an insight into the inborn reticence of the people, and various war dances and dances belonging to distinctive tribes serve as a major art form in Nagaland. More than 80 percent of the people in the state live in rural areas. The Nagas speak 60 different dialects belonging to the Sino-Tibetan family of languages. Nagamese, a variant language form of Assamese and other local dialects is the most widely spoken market language. One interesting aspect of the linguistic makeup of Nagaland is that every tribe has their own mother tongue language, but the various tribes are able to communicate with each other through the use of the unified Nagamese language. As such, Nagamese is not a mother tongue of any of the individual tribes and it is also not a written language. English, the official state language is widely spoken in official circles and is the medium for education in Nagaland. Hindi, the official language of the entire nation, is also spoken by many individuals in the state as well. Christianity is the predominant religion in Nagaland. The census of 2001 recorded the state's Christian population at 1,988,349, which makes up about 90.02 percent of the state's population, and makes Nagaland one of the three Christian-majority states in India, and the only state where Christians form over 90 percent of the population. The state has a very high church attendance rate in both urban and rural areas, and some of the largest of Asia's churches dominate the skylines of the major cities of Nagaland, such as Kohima, Dimapur and Mokokchung. Among Christians, Baptists are the predominant group, constituting more than 75 percent of the state's population. As a result of this strong presence, Nagaland is known as "the most populated Baptist state in the world," with an even greater Baptist population than Mississippi, where 55 percent of its population is Baptist. In addition to Baptists, Catholics, Revivalists, and Pentecostals are the other Christian denominations in the state. Catholics are found in significant numbers in parts of Wokha district, and also in the urban areas of Kohima and Dimapur. Unlike the rest of India where their presence is much greater, Hinduism and Islam are minority religions in Nagaland, making up about 7.7 percent and 1.8 percent of the population respectively. A small minority of the population, less than 0.3 percent, still practice the traditional animist religions, and are mainly concentrated in Peren and some of the state's eastern districts. ↑ Verrier Elwin, The Nagas in the Nineteenth Century (Oxford University Press, 1969, ISBN 0195600045). ↑ Dawn of Peace in Nagaland Retrieved March 13, 2008. This page was last modified on 6 November 2018, at 00:28.